Wolf centers have popped up all over the country in the last couple decades, ranging from official breeding centers for endangered species reintroduction programs to sanctuaries for wolves and wolf-dog hybrids some fool momentarily thought would make a neat pet. You’re also probably near a Mexican gray wolf, one of the country’s rarest mammals. They’ve been tied in a bureaucratic knot since their territory crosses state and national boundaries and encroaches on federal land ranchers have grown accustomed to grazing at a discount. 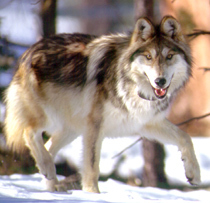 The project has released only five new wolves since 2003 and none after 2008. Hunters or ranchers have shot 14 since 2003. The Wildlife Service just announced it wouldn’t release any again this year. So the captive population has grown to something like 300 or 400. There are so many in captivity now, there’s almost certainly one near you. Chicagoans have Brookfield Zoo; New Yorkers have the Wolf Conservation Center in Westchester; the California Wolf Center near Escondido; Columbus Zoo and just about every zoo in Texas and the southwest. Like the wolves around Yellowstone, they’ve been the subject to a grind of lawsuits. Now Arizona hunters are pushing proposition 109, which would make what they call a sport a constitutional right. Does any other recreational activity get that kind of special treatment? I don’t even have a constitutional right to play baseball. The gist of the proposition is that it would take wildlife management out of the hands of pesky scientists and give it to politicians. Brilliant. So far, it’s likely to pass, according to this poll from AZCentral. If this passes with the FWS be forced to retake control of the program, the way they agreed to when they settled a lawsuit with environmental groups? Will they just deem the new Arizona plan unacceptable–much like even the Bush administration viewed Wyoming’s wolf management plan of no holds barred hunting? Did Hamptons beaches close for basking sharks' scary name?